Art lovers visiting the Cape are in for a fabulous time. Known in part for its magnificent art scene, Cape Cod has something to offer everyone, be they theatre buffs, music lovers, or fans of sculpture, painting, and other pieces that exhibit the talents of their creator. Compiled here are some of the best galleries to view handcrafted masterpieces on Cape Cod. Local artists and those who have flocked to Cape Cod to participate in the burgeoning art scene are featured prominently Cape-wide and their talents are truly marvelous to behold. Addison Art Gallery, Orleans: If you are looking for a gallery that not only showcases many local Cape Cod artists, but also works from all over the United States, Mexico, and France, then the Addison Art Gallery in Orleans should definitely be a stop on your visit. The gallery overlooks Town Cove in a classic Cape house, making for a very scenic and pleasant viewing experience. The exhibitions are from many different mediums, including pastels, watercolors, oil paintings, photography, sculpture, and mixed media. Struna Galleries, Brewster and Chatham: With two locations, Struna Galleries offers two chances to view some absolutely amazing artwork. The galleries feature the work of Timothy Jon Struna, renowned artist, painter, and printmaker. The gallery in Brewster is also Struna’s studio, while the gallery in Chatham features his work and is owned by his daughter. Be sure to stop by and view some fine Cape Cod artwork produced by a very talented Cape Cod artist. Cape Cod Museum of Art, Dennis: Comprised of seven distinct galleries, the Cape Cod Museum of Art has something for everyone, including its very own sculpture garden. Admission is $9 for adults, $8 for seniors (62+), $5 for ages 13-18, and free for children under 12. The CCMoA also offers classes for visitors with an extended stay who may want to try something new. Tao Water Art Gallery, Barnstable and Provincetown: These two galleries feature contemporary Chinese art for patrons who want something a little different. The gallery in Barnstable represents over 30 artists from all over the globe, while the gallery in Provincetown has a greater focus on emerging artists. The Schoolhouse Gallery, Provincetown: Specializing in modern and contemporary painting, photography, and printmaking, the Schoolhouse Gallery on Commercial Street in Provincetown is a great stop on any trip. Representing over 50 artists from the Outer Cape, Europe, and the US, the gallery is truly awe inspiring. Director/owner Mike Carroll also conducts individual artist’s studio visits with clients. Left Bank Gallery, Wellfleet and Orleans: Rotating collections of paintings fill the space of the Left Bank Gallery and are paired with “lofty, gestural mobiles”. Owner Audrey Sherwin Parent uses her gallery space to pair canvases and sculptures with functional ware for homes as part of the idea that art should be part of our living environments. Be sure to catch one of the artist receptions this summer. Harvest Gallery and Wine Bar, Dennis: Combining fine art, food, and wine, Harvest is a terrific stop on any Cape Cod vacation. The gallery features the work of more than 30 artists. Harvest also has live music on certain nights, so check their entertainment schedule out and experience art, music, and good food and drink! Blue Heron Gallery, Wellfleet: Displaying “an extensive collection of representational contemporary art in a range of mediums, including oil, egg tempura, watercolor, pastels, acrylic, photography, etching, sculpture, and limited edition prints”, the Blue Heron Gallery is a great stop on the Outer Cape. The two floor exhibit area is filled with the work of many award-winning artists from all over the US. Be sure to stop by an opening (listed on the website)! Nickerson Art Gallery, Chatham: Featuring the work of local artists ranging from traditional to contemporary, Nickerson Art Gallery is a fantastic place to stop and they are located right on Main Street in Chatham! Shaw Cramer Gallery, Vineyard Haven: Located on Martha’s Vineyard, the Shaw Cramer Gallery represents many innovative and contemporary artists from the Island, as well as nationally acclaimed artists. Located just two blocks from the ferry, this gallery is truly in the heart of Vineyard Haven and is a marvelous place to stop on any trip to the Island. Nantucket Carving and Folk Art, Nantucket: If you are looking to view some unique and interesting artwork, then stop by Nantucket Carving and Folk Art on your trip to Nantucket. The gallery features the work of many local artists and is certainly worth the journey. Osborn and Rugh Gallery, Falmouth: Featuring the work of husband and wife duo, Hillary Osborn and Doug Rugh, this gallery doubles as a working studio and visitors are welcome to observe painting in progress. The duo are both oil painters and will happily engage in discussion of their medium with guests. This gallery is a true highlight of the Upper Cape. This list comprises only a small fraction of the wonderful galleries that the Cape and Islands have to offer, so be sure to keep a keen eye for local artists wherever they may be, as their craft is a treasure to the area. 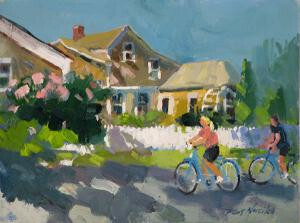 "Biking Orleans" by Robert Noreika is one of the beautiful plein air works featured at the Addison Art Gallery in Orleans. Image courtesy Addison Art Gallery.